More than 35 years of experience and competence in the sector of bike computers, wearables and lighting systems have made SIGMA SPORT, a German company of long standing tradition, into a successful global player. With a sales and distribution network in more than 60 countries the manufacturer of microelectronics has built a reputation in the bike and sports industry. 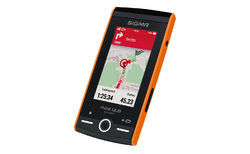 The ROX 12.0 SPORT from SIGMA is the company's latest development in the area of GPS bike computers. Apart from the known training functions of the ROX series, the ROX 12.0 has a completely new map-based navigation system, which creates the best routing for every sport profile on road and off road. The high-resolution, transflective 3-inch colour display, which is extremely easy to read even in direct sunlight, features a graphical user interface that has a modern design and can be used easily and intuitively thanks to touch functionality and the six buttons provided. The Home button with which the user can return to the main menu directly from any menu item is especially practical. The ROX 12.0 has been developed for maximum performance and scores points not only due to its robust housing but also thanks to its fast route calculation function and fluid map generation. The uncomplicated and rapid exchange of data via WiFi enables uploading to the SIGMA CLOUD and selected training portals, whereby tours from the Komoot, Strava and GPSies portals can also be loaded directly into the ROX 12.0 and then used for bike trips. For detailed analysis, the user can view and exactly evaluate his values by means of the SIGMA LINK app and the DATA CENTER.